I love the quote, "Some years ask the questions, and some years answer those questions." I think 22 was half and half! 22 was a great year. Which if you think I am just saying that Look at my 2016 year review. Some years are just not the best. 22 however was everything and more I could have ever asked for. Now here is one of my favorite post anyone could make! 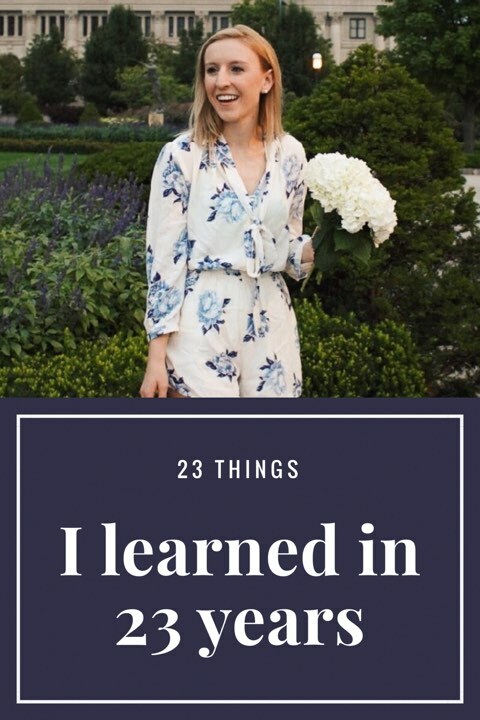 What I learned in 23 years. 23. There will always be another bus, train, plane, car. Trust me on this. No matter how much planning, how much asking, statistically you are bound to miss one of these. 22 I missed a train and a plane. Both equally traumatizing at the moment. One I ended up munching on a pink covered pastry and champagne, the other I spent a couple of hours catching up with loved ones. It sucked in the moment, but take it as an opportunity. 22. You are so much younger than you think you are. The other day someone asked me how old I was and I wanted to say FORTY SEVEN. I still get IDed, and I could probably pass as a high schooler #ShortProbz. You don't have to have your life completely together and no one expects you to. 21. SAVE. SAVE. SAVE. SAVE. SAVE. But if you stumble upon a world renowned chefs (or any other random opportunity) take it. You will not regret it and it will be a memory you can always cherish. 20. Balance is hard. Something I found is planning my week ahead day by day and having one focus a day. 18. Staying up to date on the news is your responsibility as a human of this earth, but also makes your more interesting at dinner parties. 17. No one knows what they are doing. Not even me. Not even you. I honestly think it is how good you can wing it in this life. 16. Be thankful. I am a problem solver and developer. I always want to improve, but also think about the things that don't need improvement and the things that bring you joy in the day to day. 15. Ranch will make anything better. 14. If you can't beat them, be kinder than them. Life does not have to be this big competition, build a community, sometimes people just need a friend. 13. "Comparison is the thief of all joy" Boy did I learn that this year. 12. You can not run away from your problems, which sounds so simplistic, so I guess you just have to figure that one on your own. 11. Youe fam will always be there for you, so take the time to show your appreciation for them. 10. You are not vanilla ice cream, you are phish food not everyone is going to like you, and some people might find you as too much. Keep doing you, and you will find the people you like and the people that love you back. 9. Going going going, will only keep you going for so long. Remember to take care of yourself, eat your veggies, workout, and get enough sleep! 8. Take the time to always enjoy the small things. Take in the scenic kayak trip, the porch sitting session at sunset, holding the baby, sneaking a kiss and smelling the fresh flowers. The small things add up to the big things. 7. Life is more than the adrenaline rush, the achievement, the prestige. Life is about the people. I truly believe the meaning of life is to love and to be loved. 6. Trust me there is not much you will regret in this life. If you have that feeling it will pass. The one thing in this life you will regret is not being kind to people. 5. The amount of times Taylor Swift 22 will play when you are 22 will be insignificant. 4. The older you get, the better it gets. I'm not even kidding, sure 2016 sucked, but I also had all the freedom the the world. The older you get you can take a weekend getaway to Canada or take a couple of months off to go to Europe. The older you get the more financial freedom you have and you can choose where you want your future to take you. 3. You can learn something from everyone you meet. This is odd, but even the most difficult people I can make a challenge of what I can learn from them "If I can not get upset with this person I know I can hold my cool with a child." "If I can not argue with this person I know I will not argue with a future partner". Those are the more extremes, but you can learn something from everyone you meet. 1. If you do everything ethically, you will never question anything you do. I loved this! I'm 23 going on 24 and I agree with all of these! You are very wise. Great list! #13 absolute truth right there. Great list and yes, the older you get the better it does get. I am 43 and enjoying life so much more in these years. For someone so young, you ARE going on 43. lol. Love all your lessons. Haha Girl! I am in the same boat, I got IDed this past week to buy a lotto ticket! I love this and it makes me want to make a list right now. Thanks for sharing. It is such a fun post to do! It look me a couple of days, but one of my favorites! You are wiser than your years! Love it. Personally I think each hair colour has more fun. Haha Agreed! It is always what you make of it! Yours looks great it your propic! I love the bangs! I love this! It is a lot of wisdom for 23 years!